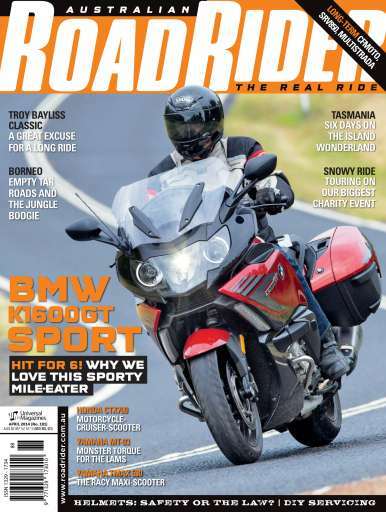 Join us on some fantastic rides in the latest issue of ARR. We’ll take you on the Snowy Ride, one of Australia’s premier charity-based riding events, and on a round-about way to the Troy Bayliss Classic. And you couldn’t get as different as the other two destinations in this issue: the rider’s paradise of Tasmania and the unexpected riding pleasures of Borneo! Our tests begin with BMW’s ultra-sporty touring bike, the mighty K1600GT Sport. We’ve been out riding the new Honda CTX700N, something decided new and different. We’ve also got a test of Yamaha’s torque-monster for learners, the MT-03, and its other new funster, the TMAX 530, possibly the sportiest maxi-scooter on the market. Naturally, expect a lot more good, informative reading, including our first report on our long-term Ducati Multistrada and CFMoto 650TK, educated analysis of helmet issues, and what you need to know before doing your own bike servicing.